Tommy Howell was the Sugarloaf trainer, that the Rollins family owned. Their top horse at the time was Eternal Sun. Donald Paschal started him for Dr. Myers of Woodbury. The Rollins' later moved to Atlanta. In 1970 Wink Groover of Etowah Tn. rode their horse, Aces Sensation to the WGC. 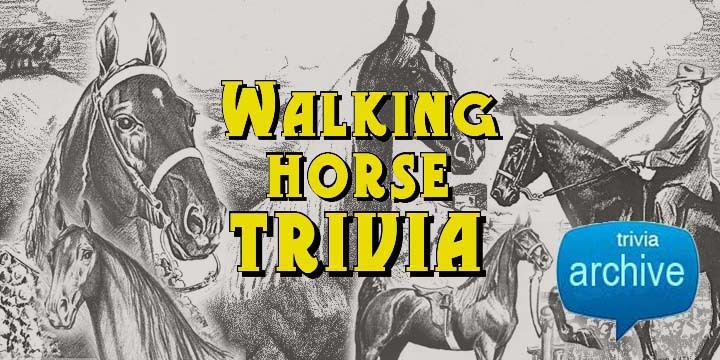 What TWH-owning country music singer sang "Lonesome 77203" ? Hawkshaw Hawkins. He and Cowboy Copas, are buried at Forest Lawn Cemetery. Our family drove out to view ALL the flowers...not long after their funerals. 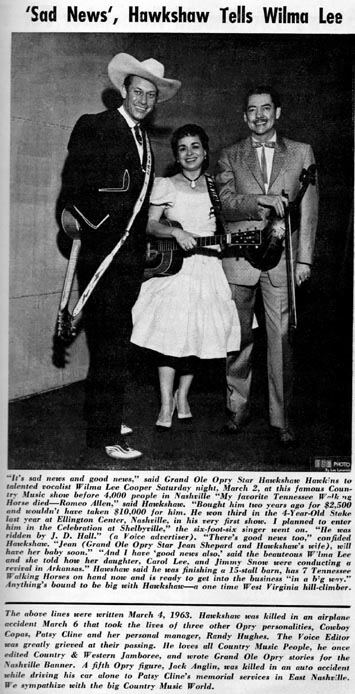 It didn't take much to excite us, back in those days and my father was a big OPRY fan. Forest Lawn is right across the hwy from the old Solitude Stock Farm (Worrell's). Did he die in the same plane crash as Patsy Cline? Yes. Hawkshaw Hawkins, Patsy Cline, & Cowboy Copas all died in the same plane crash. Dickie Pate used to show a stud named Hawk's Memory that was named after him. My dad raised the Romeo Allen. Wonder if the one Hawkshaw is speaking of was one of his colts? I believe the original Romeo Allen would have been too old in 1963. How many times was Shaker's Shocker shown in his lifetime? I believe Shocker made only ONE show in '66...being The Celebration...4 yr prelim and WGC. His show career was light, not sure of the exact #. If my math is right, the correct answer is 9. Well, then there is more than that. He was shown at the Celebration the next year after he won and perhaps the year after that. Help me out here, OHM. I believe he showed at the Celebration several years after he won. I remember people around us saying that she should have retired him a winner. Graymare, you're absolutely right. He was shown several more times, but I'm not sure how many. I was thinking he won the stake at the Fun Show one year. I saw him show in the stake, my first time at the Celebration in 67, tied about eighth. He showed again in 68 & didn't tie at all. Last friday, I passed a direct grandson of Shockers, that a former co-worker owns. Connie's been a horse show organist over 20 yrs...I'm sure. For many yrs, she played about every one-nighter in Mid TN, along with the International. She does The Celebration day classes, only. There was an organist between Larry Bright and Jimmy Richardson and also at least one before Richardson, back in the 40's I think. Who was the one that made it sound like a train? Smitty, I think he played for Saddlebreds and only for a short time at the Celebration?